In Introduction to ontologies you have learnt basic ideas about ontologies. Ontologies consist of classes, properties and individuals. Classes describe sets of objects. Properties describe relations between classes and attributes of classes. Individuals are instances of classes linked with other individuals by properties. Classes may be organized into hierarchies. Properties may be organized into hierarchies. There are object properties and data properties. Properties have domains and ranges. The above information can be expressed in RDF Schema which is a simple ontology language for the Semantic Web. How to say that the range of a property hasChildren is Person when applied to a person and Elephant when applied to an elephant? How to say that all instances of person have a mother that is also a person, or that persons have exactly 2 parents? How to say that isPartOf is a transitive property, that hasPart is the inverse of isPartOf or that touches is symmetrical? In this lab, you will get to know more advanced ontologies based on Description Logics (DL). You will learn the DL languages and understand how OWL corresponds to selected DL. Semantic networks were not equipped with formal logic-based semantics. concept definitions (necessary and sufficient conditions) e.g. 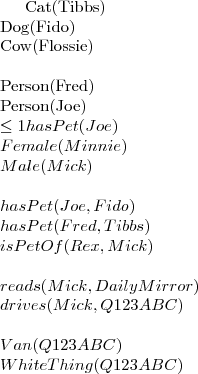 there exists concept constructors using nominals e.g. Not having UNA means that two concepts with different names may be allowed by some inference to be shown to be equivalent. Not having CWA, or rather having the Open world assumption (OWA) means that lack of knowledge of a fact does not immediately imply knowledge of the negation of a fact. OPTIONAL: What DL languages are equivalent to OWL 2 profiles? Here we will do some Description Logics „with pen and paper”. Let's check if you understand this difference properly: Take your ontology from one of the previous labs (WebProtege or Protege). Identify which statements belong to Terminology (TBox) and World Description (ABox). Put them in the report divided into two sections: TBox and ABox. NOTE: You don't have to translate the statements into DL. Just select parts of the existing file.